Invacare is a long trusted name Home Diagnostic Products. Invacare makes pulse oximeters, thermometers and several styles of Blood Pressure Monitors. The pulse oximeters, manufactured by invacare, are more clinical than what you would see with some other brands. 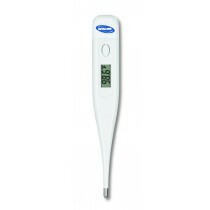 Invacare thermometers include a stick thermometers for everyday home use and instant ear thermometers for use with a young child or someone who has a strong gag reflex to stick thermometers. While you are there, be sure to get some replacement probe covers, so that there is no worry of storing germs. Invacare blood pressure monitors come in a few different styles. Choose from all-in-one digital wrist blood pressure monitors and professional style shygmomanometers. Invacare even makes a nurse-style home monitoring kit featuring a sphygmomanometer and a stethoscope.